GRAB THE AD-FREE PDF FOR THE VELVET CROCHET BEANIE HERE. Are you feeling the velvet craze? I grew up in the 90’s and I remember wearing velvet dresses especially during holidays and I’d be lying if I said I wouldn’t wear them now! When I saw the velvet yarns hit the stores, I couldn’t resist. So many dark beautiful shades and also pretty light neutrals. In my opinion, it is a good price too! At my Michael’s store (US), it is about $10 a skein (but you can always use that wonderful 50% coupon) and each skein comes with 315 yards of the velvety goodness! I’ve been so in love with the Bernat Velvet yarn. I’ve already made a circle pillow and it’s so squishy and soft! You can find the free pattern for that here. I can’t wait to make more projects with this yarn. I’m currently having a cardigan sweater being tested using the velvet yarn and it will be released mid-November! Be sure to subscribe to my email so you don’t miss out. 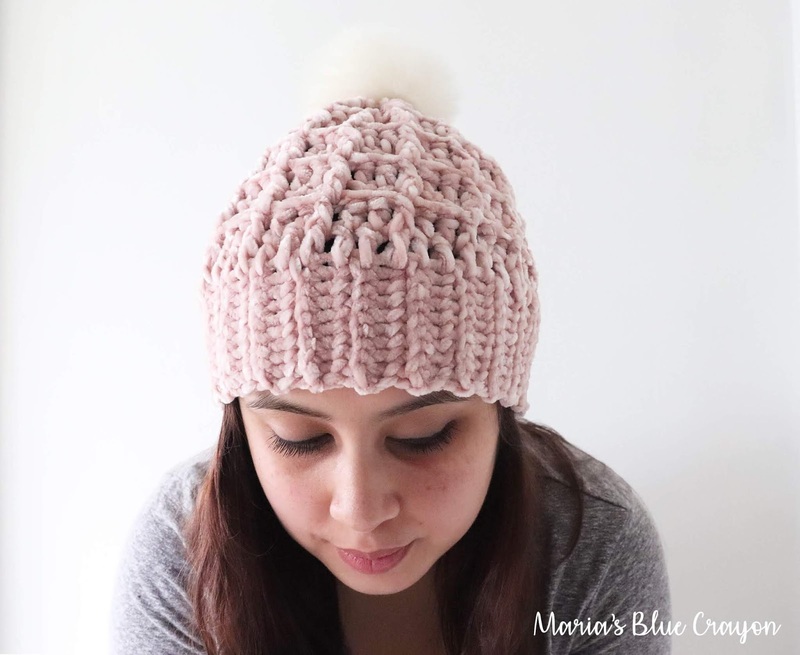 Since the velvet yarn is so so soft and wonderful to work with and drapes like a dream, I thought a crochet beanie would be fun since it drapes so effortlessly and it’s always nice to have something soft to wear on your head while keeping you warm. I’m really happy with the outcome! The stitch definition isn’t great with this yarn so I used the waffle stitch that uses front post double crochets paired with double crochets to create a nice texture that stands out against this smooth yarn. I used a really pretty soft pink color. I don’t usually gravitate towards warm tones, but this blushy pink was so pretty I couldn’t pass it up! It will be a fun hat to wear to compliment by olive green winter jacket. I’ve also crocheted another sample of this beanie with some clearance yarn I got at Hobby Lobby months ago when they were clearancing out some of their yarns. I had to adjust the size since the yarn was a weight 5 and thinner than the velvet yarn, but it was very easy to do! When making the brim, you just need to have the number of rows divisible by three. I will have those instructions in the pattern notes! If using different yarns, I suggest sticking with weight 5 and 6. With the easy adjustments, you can not only use different yarns but you can also make different sizes! You will just need to know the head circumference of what size you would like to make and make the brim that length while also keeping in mind that the number of rows needs to be divisible by three. My blogger friend, Katie, from Salty Pearl Crochet has a great resource for different hat sizes if you need it! I also added a pom pom on top because I love the the look of faux fur pom poms! I think they add a nice finishing touch, but of course you can opt out of the pom if you would rather go without it! It’s hard to see in the photos above because it blends in so well with the white wall behind me, but you can see it much clearer here in this photo I got with my newest puppy, Penny! 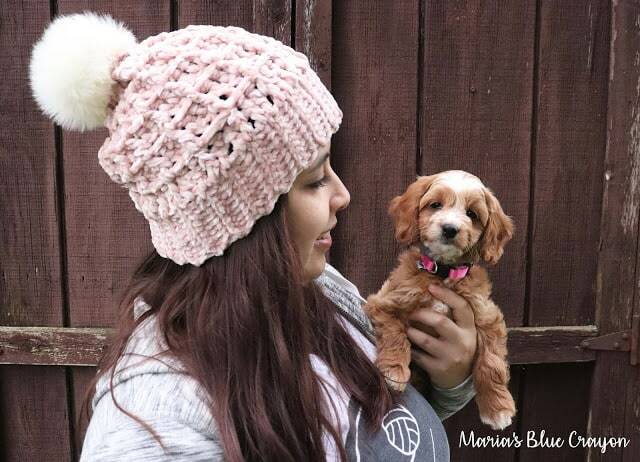 She is a cockapoo, just like her brother Milo who we got earlier this year. You may remember seeing him in older blog posts of the crochet basket and doggy bowl patterns. Beginning chain 3 when making the main portion of the hat DOES count as a stitch. Beginning chain 1 when making the brim DOES NOT count as a stitch. To adjust for sizing, decrease or increase number of rows for brim. The number of rows need to be a multiple of 3. I suggest you also make the number of rows for the brim 1-2 inches smaller than head circumference for a nice, snug fit. 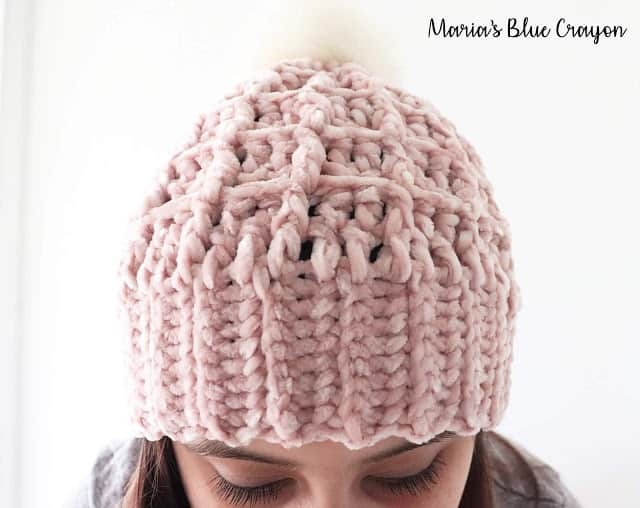 When decreasing/increasing size, you may also need to decrease/increase number of rows for the main hat portion of the pattern. We will be turning our work after each round worked in the main hat section. This is not always common, but necessary in this pattern to create the waffle pattern. Slip stitch to first row, flip inside out so the slip stitch seam is facing inwards. Do not fasten off. Repeat rows 2-3 until you have 12 rows total of the main hat. Fasten off and leave tail for cinching. Using tapestry needle, weave yarn tail in and out of top stitches and cinch tightly. Attach pom pom as desired. I have also found another method that you may enjoy doing that cinch up the top of your beanie. 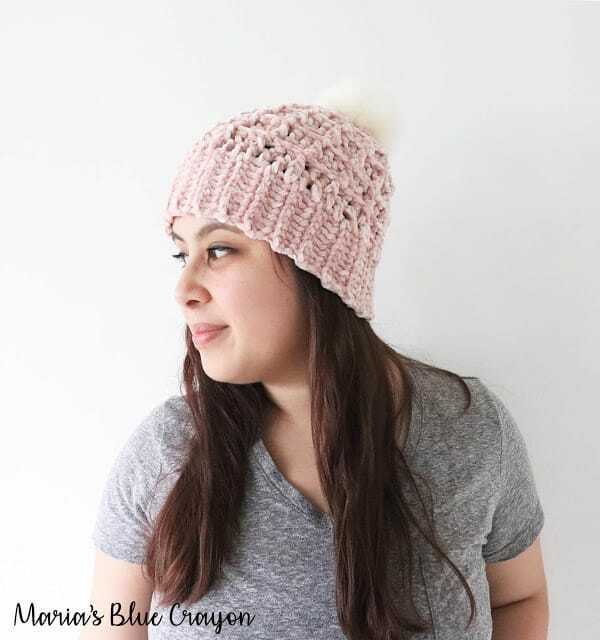 This tutorial by Stitch and Hustle is very easy and a great way to create that perfect closing for the top of you crochet beanie! Find the tutorial here(video included).